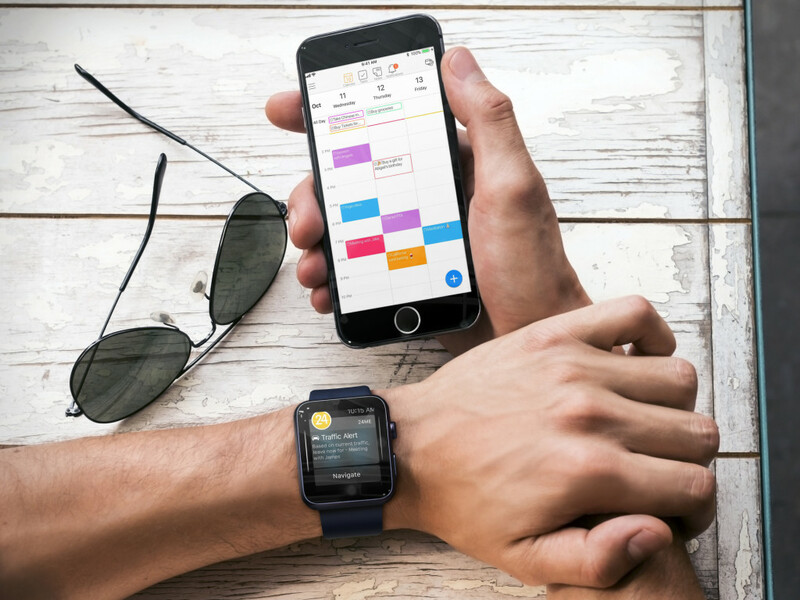 24me is your smart personal assistant that unifies calendar, to-do list, notes and personal accounts. It helps you manage your schedule and keeps you on top of things. 24me automatically tells you what’s coming up next and provides you with personalized notifications to keep you on top of things so you could focus on what matters most. Your events, tasks, notes and real life accounts all fully synced appear on your calendar. No need to use multiple apps to get a sense of what’s happening next. 24me provides a very simple and organized way for you to navigate throughout the day. To add an item, tap the + button on the bottom right of the screen. Then add your event, task or note and tap the ‘Add’ button on the top right of the screen. The newly created item will appear on your current screen and on your calendar. 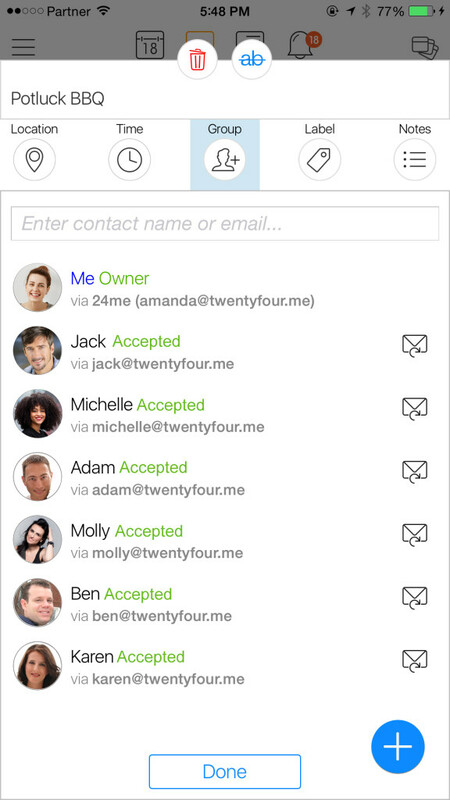 24me integrates to Google Calendar, Microsoft Outlook, Microsoft Exchange, Yahoo! Calendar, Apple iCal and many more. No need to put usernames and passwords. Just login and it’s all set up for you. 24me provides Day view, List View and Month view, so you can choose the best way to use it. Go to your iPhone’s Settings. Tap on: ‘Mail, Contacts, Calendars’. Select your account from the options below, and put your email and add the password associated with this account. Once you set your account, go back to 24me, which is now synced automatically with your new calendar account. With a tap of a button you can: Pay bills, send gifts for events, post greetings, call, text and email. Shares events, tasks, reminders and notes with your family and friends with real time sync between all participants. 24me allows you to easily keep track of your busy schedule. With smart alerts for your daily agenda, time to leave for meetings based on traffic and weather, 24me keeps you up to date so you never miss an important event, no matter how busy you get. 24me is one of the easiest ways to keep track of all the moving parts in your life, from meetings to attend to birthdays to celebrate. The default view on the iPad is week view and on iPhone it is list view. Sometimes you want to check on things further out in your schedule, so you may want to change your calendar view. 24me has 5 different views so you can check out what’s coming up in the next month, week, 3-Days, day with the option of viewing it in list view. To return to today’s date, tap on the Calendar icon on the top bar and it will bring you back to today’s date. How do you use 24me? Is it an essential part of your daily routine? Let us know in the comments below! Is there a way to set up reoccurring daily or weekly tasks? Yes. Under the Time tab of any task there is a repeat option that does exactly that. What about a task that is 5 days a week, no weekends? That’s also supported. You can set Weekdays and Weekends. One thing that would be super helpful would be the ability to attach document. As an attorney, I will draft documents that needs to be emailed, filed or reviewed on certain days and i’ll have phone calls to discuss a document. Would be perfect if instead of taking a pic of doc and attaching, I could attach the doc itself. Thank you! Thanks for the feedback. This is indeed on our list! 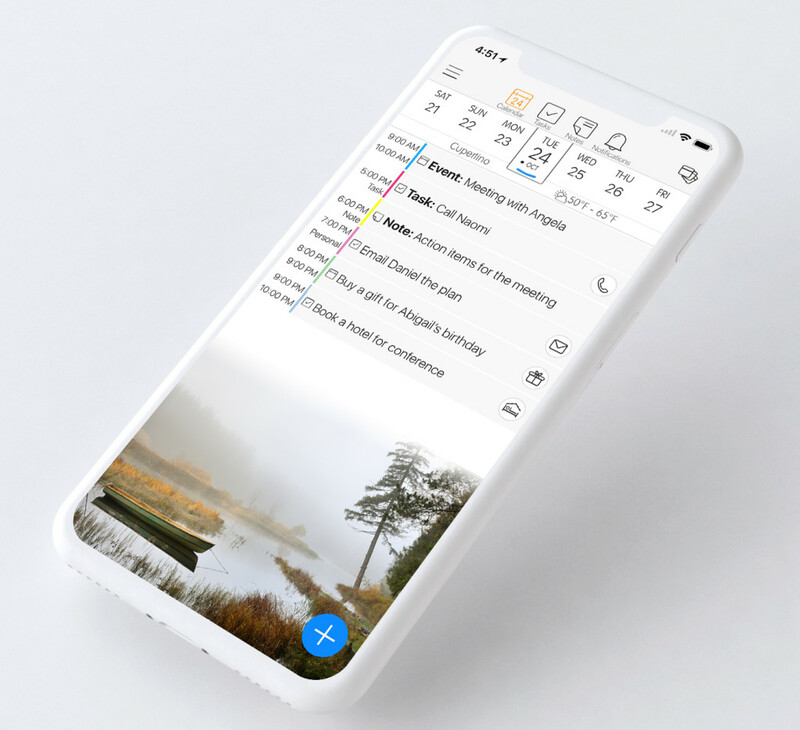 The All Day section on the Day view of the calendar can be expanded. You can determine the size that fits you and it will stay like that. Thanks for the clarification. We are working on allowing the dragging on the day view too. Is there a way to share notes in the app? Yes, there is. When you tap on any note, then go to the Group tab, you can add email address of other people you’d like to share the note with. The note will then be shared with them. For best experience, the people you share with should also have 24me installed. Then, the notes you share with them will be listed in their 24me. You can actually use ANY calendar app you’d like on your Mac and it will sync events with 24me. When you enter the address, do you choose from one of the options suggested by 24me? Hiya! Im struggling with my calendar the colours wont change. Its all blue or clear. Please can someone help me its driving me insaine. Hello! to change the color of event, you can go to the Apple calendar app, click on the Calendars button at the bottom of the screen, and from there, find the calendar account of your meetings and change its color. The new color will be shown in 24me. 1.how do i sync tasks, it shows all the catagories i have created in ios, but how do i delete a category from 24me, when its already deleted from ios. 2. is 24me sync’d across all ios calendar, notes, to do, email, etc any calendar, etc. i have setup on my ios device. 3. where is everything backup and stored at. 1. To delete a category (a label), tap on any task, then go to its Labels tab, and from there, swipe on the label you’d like to delete and delete it. 2. 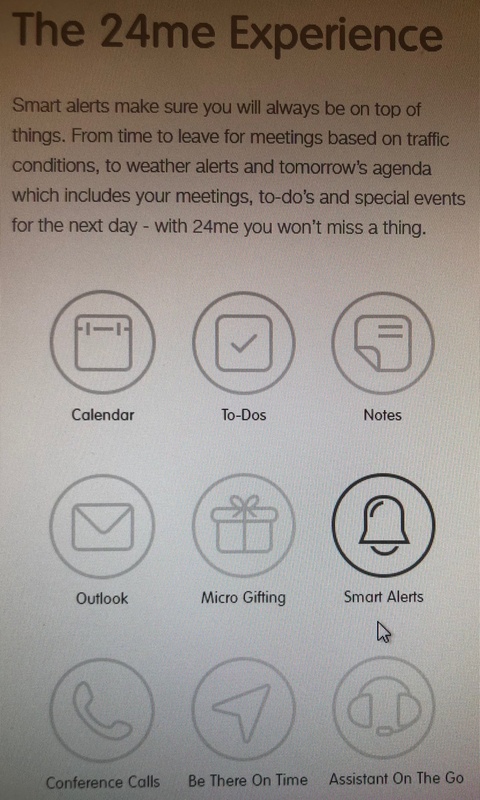 Yes, 24me syncs all your calendar account which are set on the device. Your notes are backed up on the 24me servers and can currently be accessed from any device where 24me is installed. I have similar questions…Is there any way to access and edit my tasks and notes (not my calendar) through my PC with 24me? With which task or note apps does 24me currently sync (not just allow an import)? Is there an expected date of 24me syncing with Google Tasks? 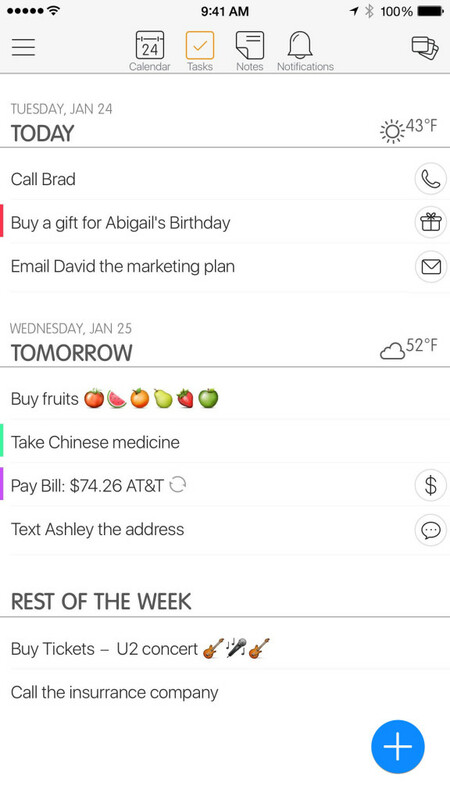 24me tasks can be synced with Apple’s Reminders. Note are currently not synced with Apple’s Notes app since Apple doesn’t permit such sync. Are my notes ever stored on my ios device, i hope so, and where would that be? Your notes are stored inside 24me on the device. Does this have location alerts?? This is something which is on the roadmap. Please stay tuned! Yes. And until our Mac version is ready, you can use any calendar app you’d like on your Mac and it will sync with 24me. You can control which calendar account are listed in 24me. TO do that go to Menu > Settings > Calendar > Visible Calendars. I think I have a cant do question. I use Calendly and SquareUp for my client meetings. I’m finding that I am setting appointments/tasks in 24me that never make it into my source email (main email that feeds my Calendly and SquareUp availibiity). How can I fix that? if at all. I think you are going to tell me to enter them in my main email – bomber. but ok.
Events/meetings entered in 24me are stored on the calendar account you choose. You can control which calendar account to use on the Calendars tab of events. Then, all apps, including the Apple calendar app, list those events in case they are connected with that calendar account. Thank you. I found the problem. 24me is defaulted with a different email address. So it was not placed on the calendar I needed it to be. I reallly love this app. I have a question. Can I use twnetyfour things on my desktop? Thanks. Desktop support is something we plan to add.